The Polaris Sportsman WV850 H.O. all-terrain vehicle comes with all the fixings and then some, built to military specifications and featuring non-pneumatic bulletproof tires. No surprise: it was developed for the United State military, able to tackle tricky terrain under fire. 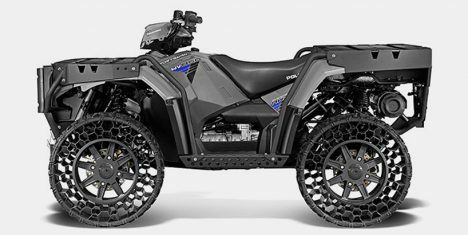 This essentially indestructible ATV features ‘terrain armor’ tire tech out of Minnesota (a state known for its cold and hot extremes), which allow tight cornering and high speeds in difficult conditions and all weather. 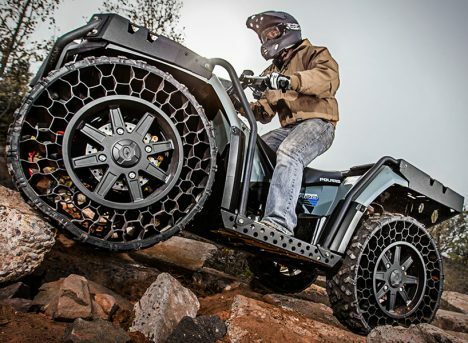 According to their makers, these “tires enhance the ‘WV850’s’ center-of-gravity and cornering.” The 77-horsepower off-roader also comes with a single-speed transmission, a high-strength steel exoskeleton, steel racks, plus a huge towing capacity (1,500 lb (680.4 kg)). 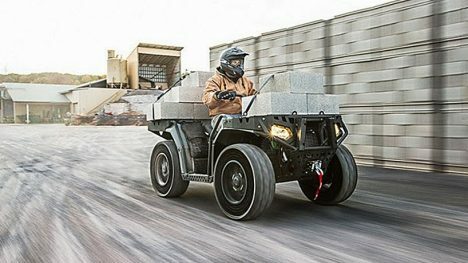 The vehicle’s non-pneumatic tires are “designed to cope with combat-level stress; they can withstand .50 caliber gunshots, even AK47 bullet damage, and roll away from ballistic scenes like nothing happened.” Might be a bit overkill, but still fun, for an everyday consumer. See more in Mods & Custom or under Transportation. April, 2017.